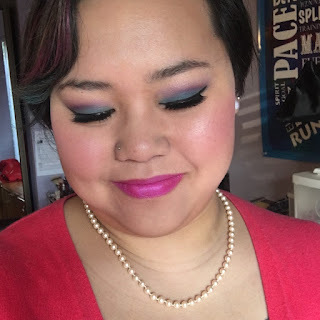 It's been a while since I've posted a tutorial/FOTD! I usually throw on makeup and hightail it out of the house most days, but I definitely needed to photograph this. It was Spirit Week at our school last week, and this particular dress-up day was themed "GI Joe vs. Barbie." Guess which one I went with? I know, I know, I look nothing like Barbie. But thanks to the new Fashionistas collection, Barbie comes in a wider variety of body types, heights, ethnicities, and styles than EVER before. They still do not have a curvy Asian Barbie, or even a petite Asian Barbie, so... here I am. I will stand in as your Curvy, Petite Asian Barbie until they make one. 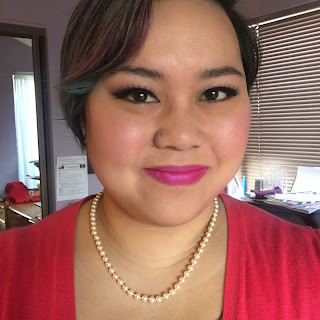 I know there are probably hundreds of Barbie makeup tutorials all over the internet, so I'm just throwing my hat into the mix here, but I thought it would be fun to indulge my super-girly side for the day. I lined my lower lashes with a UD pencil, and I can't remember which one. It was a deep bronzey-brown. Hey, no one ever said it was easy being Barbie.